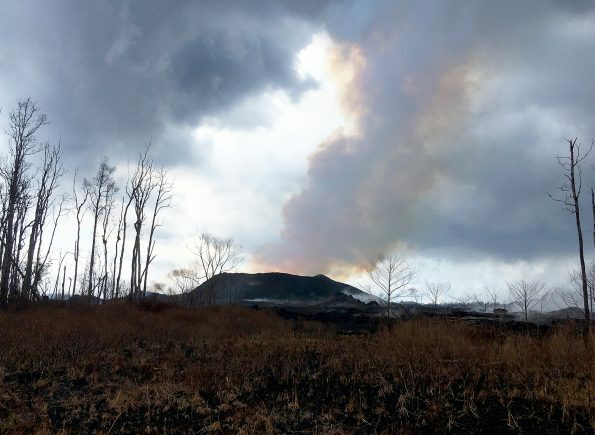 In mid-July 2018, fissure 8 (shown here) on Kīlauea Volcano’s lower East Rift Zone was emitting more than 50,000 tons of sulfur dioxide gas per day, creating high levels of vog on the Island. Since early August, lower East Rift Zone SO2 emissions have dropped to less than 100 tons per day, resulting in better air quality for Hawaii. USGS photo by T. Elias. A few years later, the volcanic activity abruptly changed to nearly continuous eruption of lava and gas, with about 2,000 tons of SO2 released daily. The continuous gas release provided little opportunity for the air to clear, and vog became a common feature for leeward Hawai‘i, where the trade winds blew the emissions.